One bus will leave directly from OLOL; a second bus will come from Westwood Parish Church to pick up the remainder of our pilgrims. Bus lists are in the porch. If you are unable to come on the trip, please let us know in advance by calling John Barrie on 233457. We will collect £10 on the buses which will leave for Queensferry by 10.45am. The ferry departs at 12.15pm. 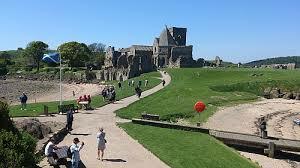 Historic Scotland advise visitors to Inchcolm to wear sturdy shoes and warm clothing.